Content Warning for depression, suicidal ideation. There are times when I feel like I’ve learned the most about self care from the internet, and from Tumblr. A relatively general definition of self care comprises any actions that you perform yourself that enhance your physical, mental, and social well-being. There are more formal and more specific definitions of self care, but what I find really interesting are the different ways in which people approach self care. I think there’s a lot of validity to the perspective above. There’s a lot of unrealistic crap out there about mental illness, and some portrayals of mental illness definitely present it as cute. But I found myself feeling really defensive after reading the above, and I feel the need to explain why. It’s true that there’s a lot of cuteness on Tumblr. Frankly, that’s one of the reasons I like it so much. 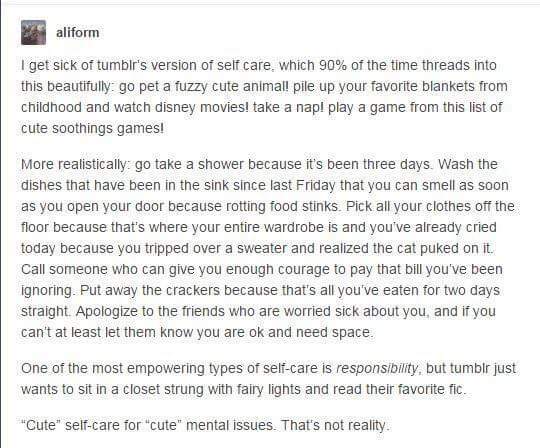 But I don’t think that the pursuit of cute as self-care is only for “cute” mental illness. I have found that I have a problem with rumination–the habit of obsessively turning over a negative idea in my head. TED Talk below provides a pretty good intro to what I mean. Rumination isn’t just unpleasant; it wrecks my ability to function. I can’t sleep because of the thoughts racing around my brain, which makes it harder to get anything done—assuming my negative thoughts themselves aren’t distracting me even further. For me, the best way to distract myself from the negative loop of soundbites in my head is frequently to pursue cute. Then there’s petting a cute furry animal. Honestly, getting a cat was one of the best things for me. She’s a reminder that at least *someone* needs me alive and cares about me, albeit in a somewhat self-centered way. (Depression lies, remember?) Having a cat keeps me functional because I have to put a roof over the cat’s head and buy kibble. It gives me a purpose. So does that mean that my mental illness* is “cute”? On the one hand, I’m lucky. I’ve always managed to maintain a high degree of academic and professional functionality. On the other hand, when I’m at my worst, I am really pretty bad. The people around me definitely don’t find it cute. At my worst, I’ve made a lot of good people miserable, and driven a lot of people away. I think the perspective above is true in another respect: Responsibility is empowering. But it’s also overwhelming. That said, I do think there are a lot of self care strategies that don’t necessarily feel good while you’re doing them, but you feel better afterwards. Dorothy Parker is credited with having said, “I hate writing, I love having written.”† I think self care strategies like exercising, cleaning, and even paying bills are like that, too. None of those activities—to me, at least—are fun. But I usually feel better after doing them in much the same way that I feel better after having written: because I accomplished something. One of my favorite Tumblrs is called Unfuck Your Habitat, or UFYH. The blog primarily deals with cleaning, but it does so in a way that is compassionate and understands that cleaning can be overwhelming. I’m still trying to internalize some of the principles behind the site, but in general, I’m glad I found it. It’s definitely changed the way I think about many aspects of self care. In the end, I think that both cute and responsibility are valid strategies of self care that work best when they’re used together. But sometimes, you need to try one before you can get to a place where you can try the other. *This is something I struggle with. Depression is frequently regarded as the common cold of mental illness, and if I manage to be fairly functional most of the time, do I get to say that I have a mental illness? Or does that just mean that my meds and therapy are working? †There’s a lot of debate about who first expressed this sentiment, but a lot of writers share it.